I love it when I find a good stash at a good price! Saturday an old acquaintance called me to ask if I wanted her rug hooking wool. She has not hooked for years. I said I would come look at it, but really did not have much hope of finding anything I wanted. You guys know the colours I hook with are anything but subdued and primitive in nature. They can be difficult to find and I often have to dye my own. Still, I headed over in the evening to check out her stash. I was floored! Gorgeous golds, yellows, purples, blues, reds…all colours I will use. 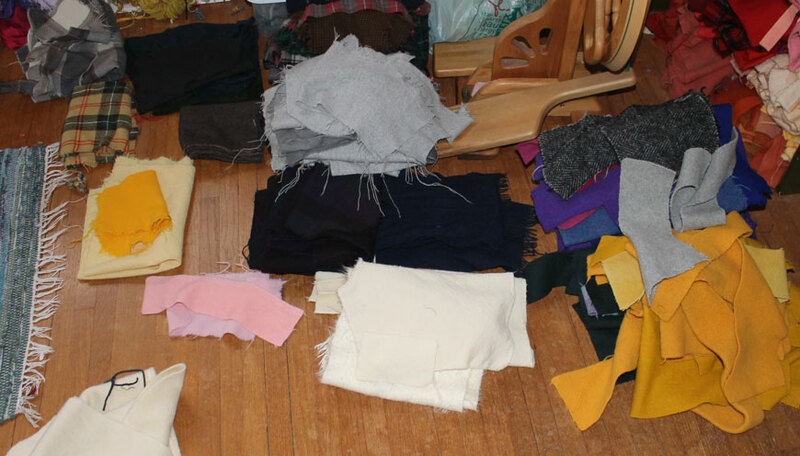 They were neatly arranged in piles on the bed…about 20 piles. Two dollars a pile or $25 for everything. Of course I took everything. There were blacks and whites in there too, and a lovely check for over-dyeing. The photo above shows about half the stash. I brought it all home and washed it up, just to remove cat hairs and be sure it was felted before hooking. I do not suspect people would wash my wall hangings, but I like to pre-wash everything I can, just in case. Yarn is problematic for me because I often cannot pre-wash the mohair and bouclés I use. Though if I dye them they are subjected to quite a bit of heat. I pull them a bit higher to allow for some shrinkage in the blocking stage. I settle for telling people to hand wash in cold water only if absolutely necessary. However, to err on the side of caution I recommend a dusting to remove dust, and a steam iron to block the piece. They are wall hangings after all, not trivets or hot pads for the table. If they were for that they would be all wool and linen, not the mixed fibres I use now. I have just started to follow your blog.So nice to find someone else in Saskatchewan with similar interests.I make owls from old felted wool blanket and am very interested in doing some wool applique soon.Would like to do some rug hooking also.I was able to visit some rug shops in Nova Scotia in Jan.of this year.Oh my all those beautiful colors of wool.Yup after that I am hooked.Anyway I was wondering if there is a shop in the Regina area to purchase wool,rug hooking books,ect. for this art.Thanks. g.a.s.